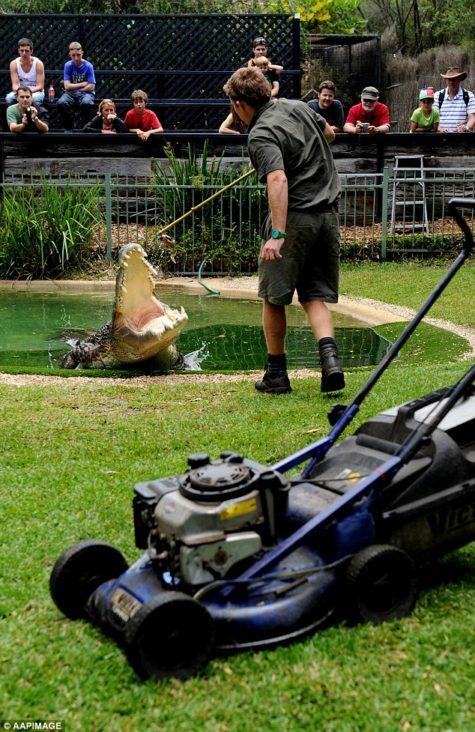 A giant saltwater crocodile named Elvis with an apparent affinity for household machinery charged at an Australian reptile park worker Wednesday before stealing his lawn mower. 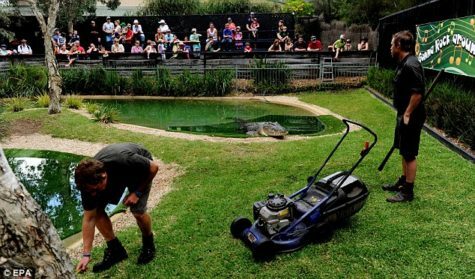 Tim Faulkner, operations manager at the Australian Reptile Park, north of Sydney, was one of three workers tending to the lawn in Elvis’ enclosure when he heard reptile keeper Billy Collett yelp. 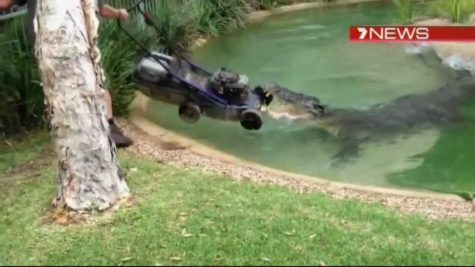 Faulkner looked up to see the 16-foot (5-meter), 1,100-pound (500-kilogram) crocodile lunging out of its lagoon at Collett, who warded the creature off with his mower. 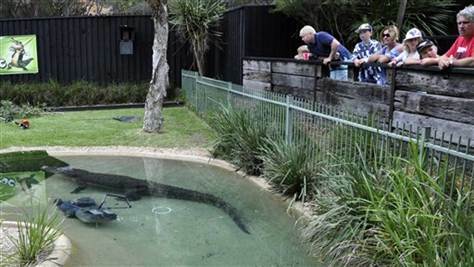 The workers quickly left the enclosure. Elvis, meanwhile, showed no signs of relinquishing his new toy and guarded it closely all morning. 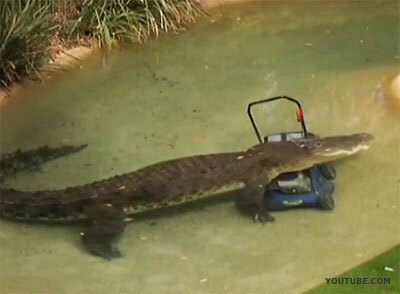 Eventually, Faulkner realized he had no other choice but to go back for the mower. 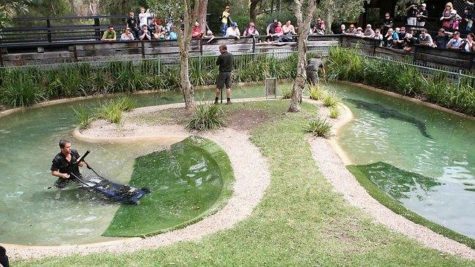 Collett lured Elvis to the opposite end of the lagoon with a heaping helping of kangaroo meat while Faulkner plunged, fully clothed, into the water. 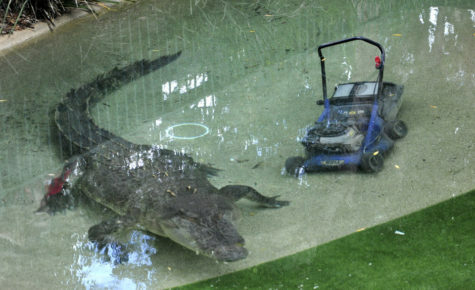 Before grabbing the mower, however, he had to search the bottom of the lagoon for two 3-inch (7-centimeter) teeth Elvis lost during the encounter. 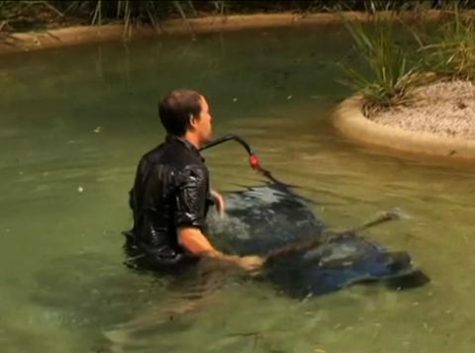 He quickly found them and escaped from the pool, unharmed and with mower in tow. 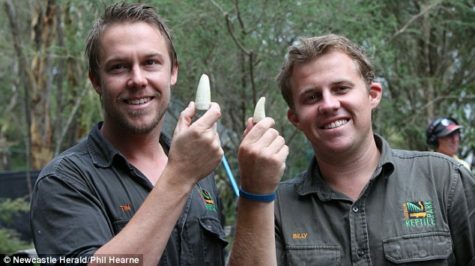 Though many may question the wisdom of going after a couple of teeth with a massive crocodile lurking just feet away, Faulkner said finding them was critical. “They clog up the filter systems,” he said. Here’s something for a real couch potato! Here’s something cool I found at Towards 2012. 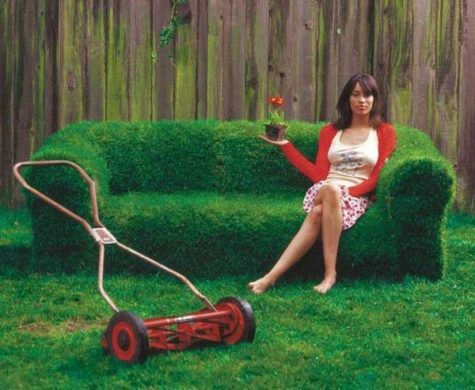 I think I’m going to make some lawn furniture like this. I got the “how-to” from Ready Made Mag and I have included it here along with observations and comments of my own. Before you begin, figure the dirt you need by multiplying the dimensions of the couch you plan to make. That would be the “length” x “width” x “height”. Next, locate a suitable spot. Think it through because you won’t be able to move it once you’ve got it done. Clear the area of grass and weeds until you have level ground, then sketch the shape of the couch into the dirt with a stick. Drive wood stakes into the ground along the perimeter of your sofa-shaped sketch, every 18″ or so, to a depth of about 12″. These will secure the form. Attach wafer-board to the stakes to create the walls of the form (illustration 2). Use a handsaw to trim the wafer-board to size. Drive in a nail every 4″ along each stake to secure the boards. This looks like the hardest part to me. And I think that it might be easier to lay it out first, then attach the wafer board to stakes. You would then be pounding in a pre-made “wall” which would be easier than trying to nail wafer-board to stakes driven into the ground. Start shoveling dirt into the form. Here’s where things get messy. 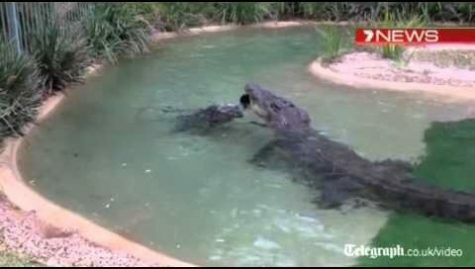 Once a foot of dirt is in place, water lightly and compress by stomping around on top of it. Do a good job of compressing! 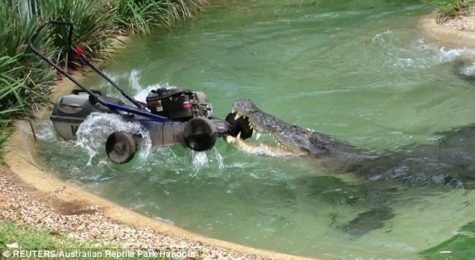 This thing is going to have to stand up on it’s own! Once the basic shape is in place and secure, carefully remove the wafer-board form. Praying the whole time that it holds together and doesn’t slump into a big pile of wet dirt! Mold the shape to your liking. 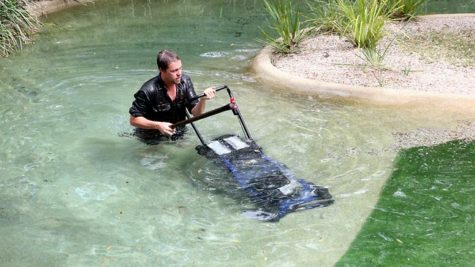 Remove any loose debris and sprinkle the sofa and other areas you’ll be sodding with a healthy layer of fertilizer and gypsite. (Is gypsite the same as gypsum? I wonder…) Water lightly. 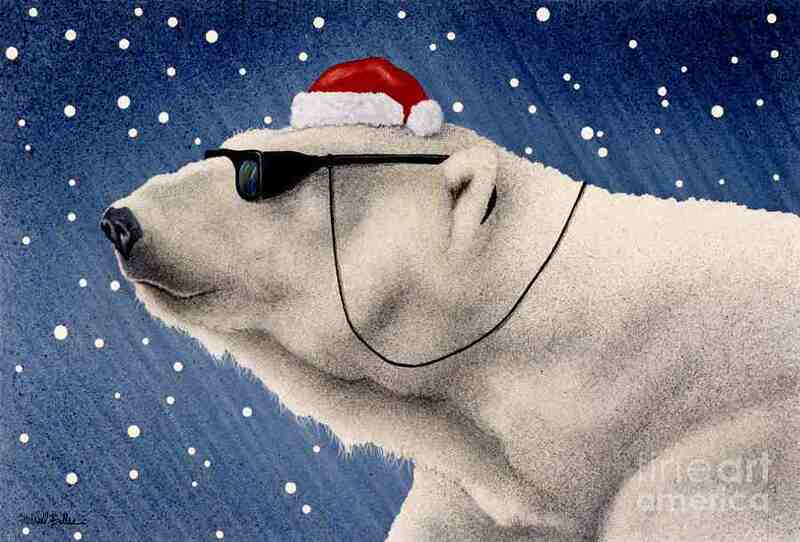 You don’t want to water it too heavily or it will begin to “melt”. For extra support, lay strips of poultry netting over the arms and back. It will be really helpful if the poultry netting is already bent to the correct shape. Don’t try to bend it over the arms and back of your “sofa”. Poultry netting can be very ornery at times – I can just see it destroying all your careful work. So, measure and bend it and then lay it on. 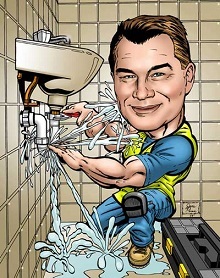 During the next few weeks, water your sofa often, soaking it thoroughly. Once the sod has taken root, remove the chopsticks or planting stakes. Trim as needed. I’m thinking how cool it would be to do a whole little outdoor living area. Maybe even have a “coffee table” complete with strawberries and mint growing out of the center of it. I wonder how well something like this would hold up.